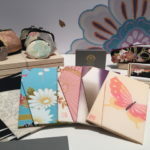 This is about two minutes video in which we show our working scene and working process in the studio. 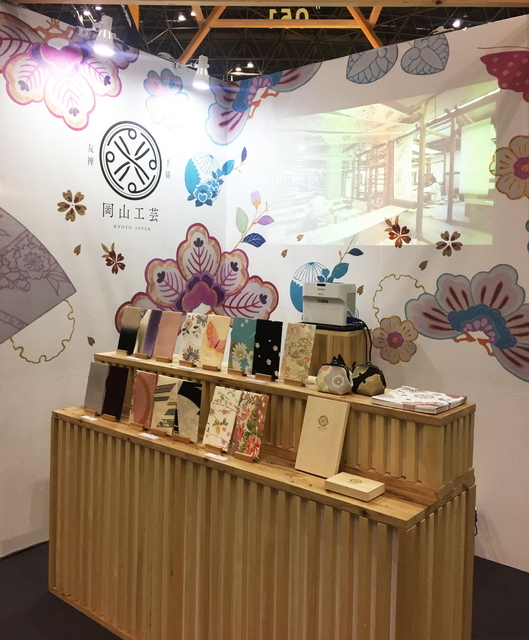 We created this video because we would like to show our products to many people when we exhibited them in Tokyo Gift Show. 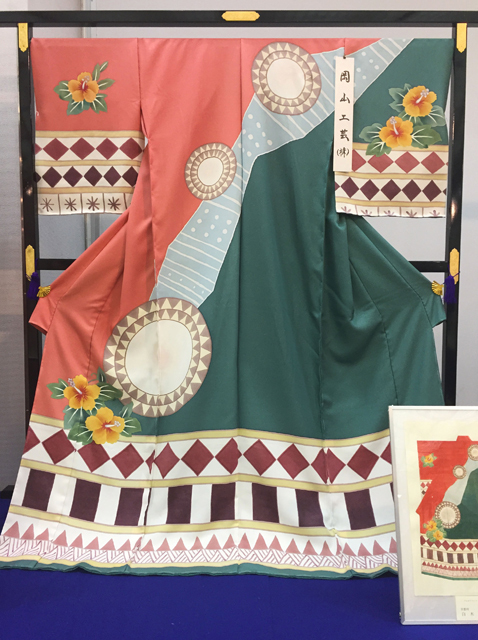 The circle of outside in the logo mark is imaged from a core wood of a bolt of cloth or from Taiko or rollers used in wakuba, which is a machine used during coloring the cloth for kimonos. 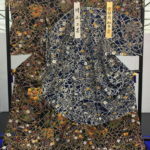 Four small rounds in the circle are images when a bolt of cloth opens a little, and they stand for the cooperation by craftsmen. 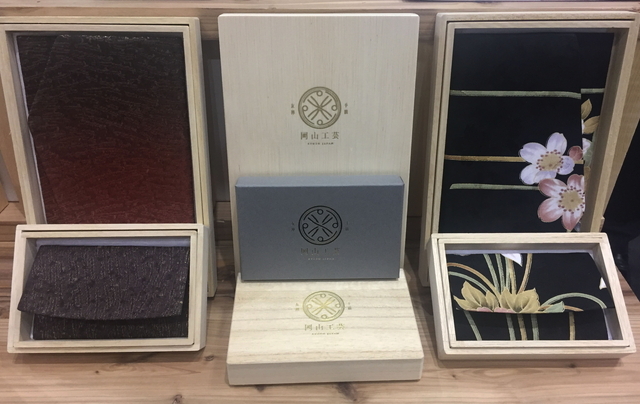 One craftsman performs his own task and deliver it to next craftsman, then after he finishes his task, he gives it to another craftsman. 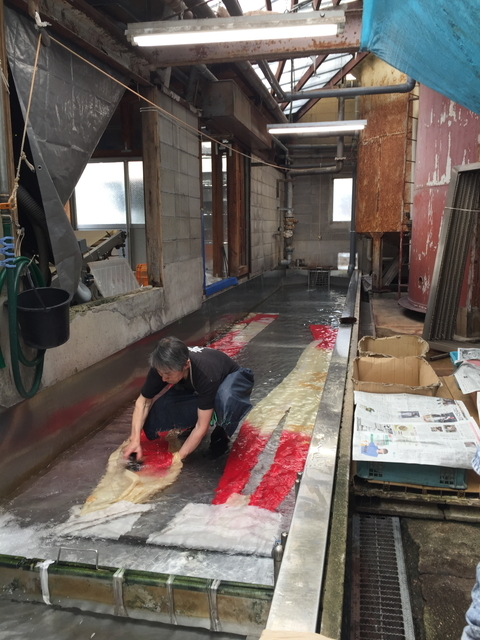 Many craftsmen work together to create a hand-painting Kyo-yuzen Kimono. 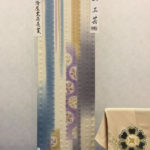 The four lines of the center are an image of tools which are used during work. 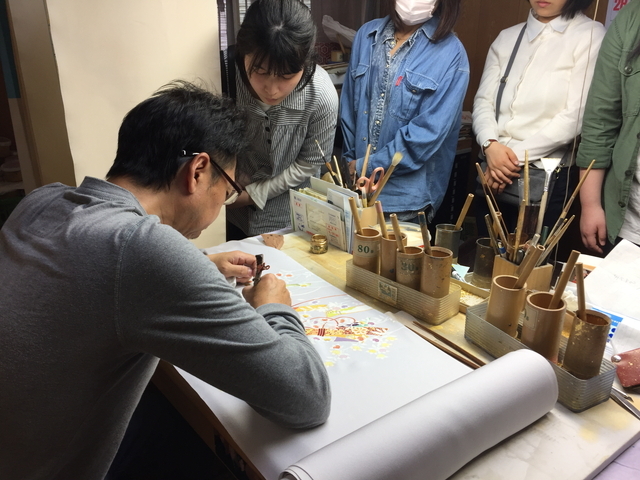 For example, a painting brush, a temple, a tool which is used when drawing lines or coloring with gold. 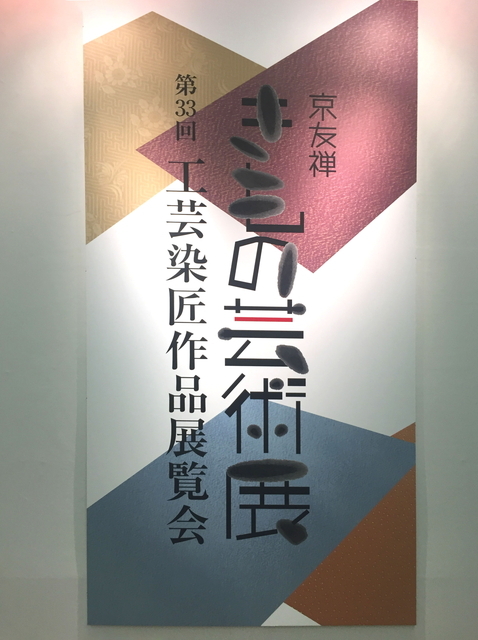 This logo represents many workers involved in Kyo-yuzen and their cooperation. 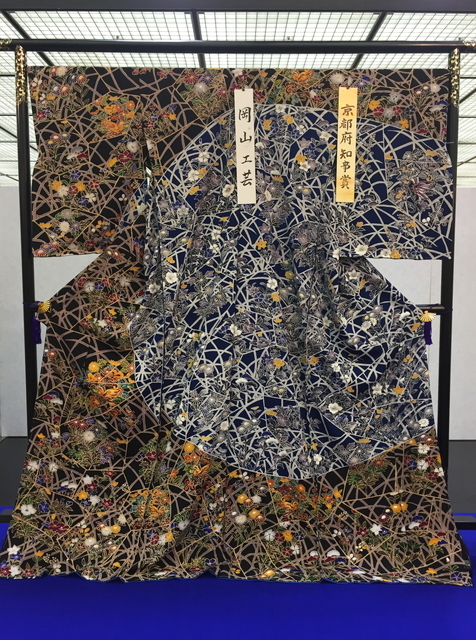 This cooperation makes an elaborate Kyo-yuzen kimonos. 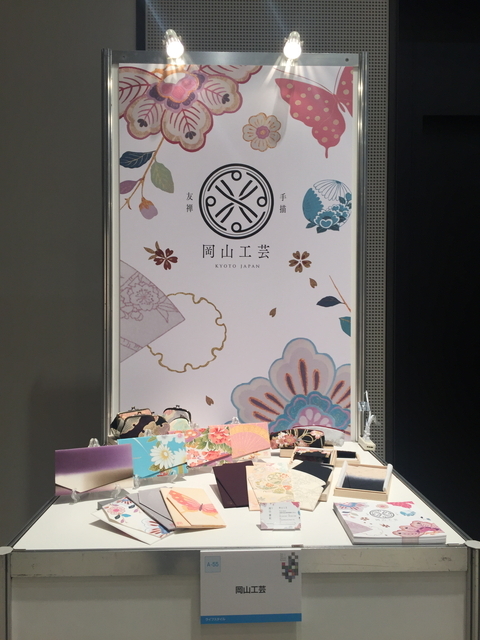 Okayama Kogei is the company just like this logo mark. 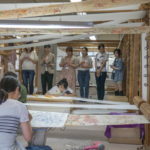 Nancy joined our workshop tour. 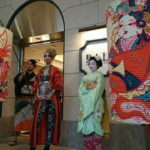 She and her companions visit us every year from the US. At the request they do something new this year, we arranged for them to produce a dyed picture in the frame. 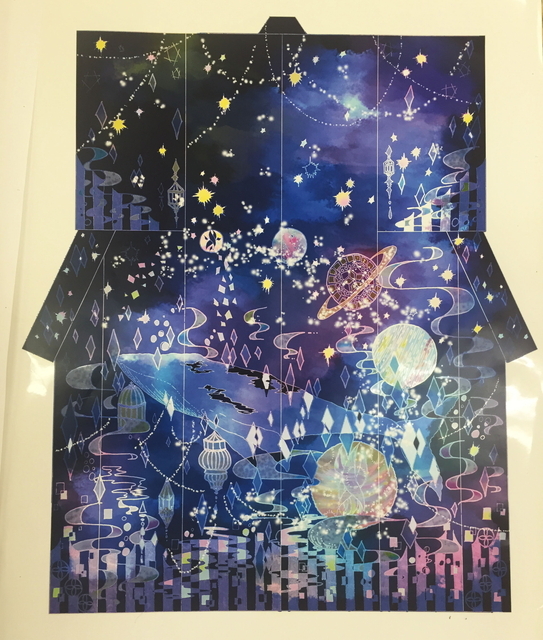 It is a postcard-sized frame. Take-away available on the spot. It has a favorable reputation. 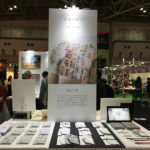 The 35th exhibition of craft and dyeing design works was held in Miyako Messe convention hall. 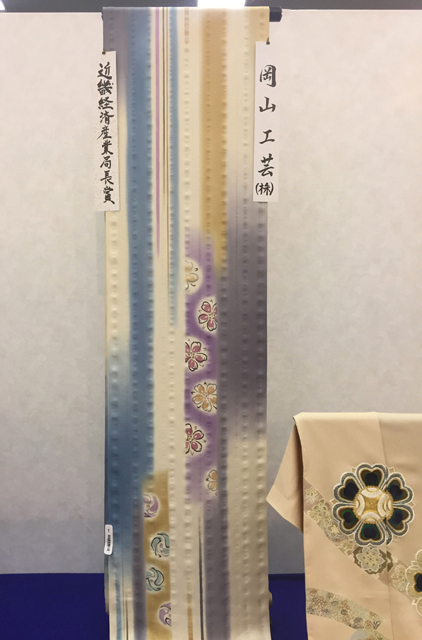 Our kimono cloth won the award of the Chief of Kinki Bureau of Economy, Trade and Industry. 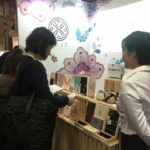 An event for new products from different companies took place on this day, thronged with visitors. 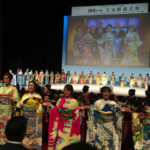 We produced formal kimonos in the image of Burkina Faso under the theme of “Kimonos reflect the world”. 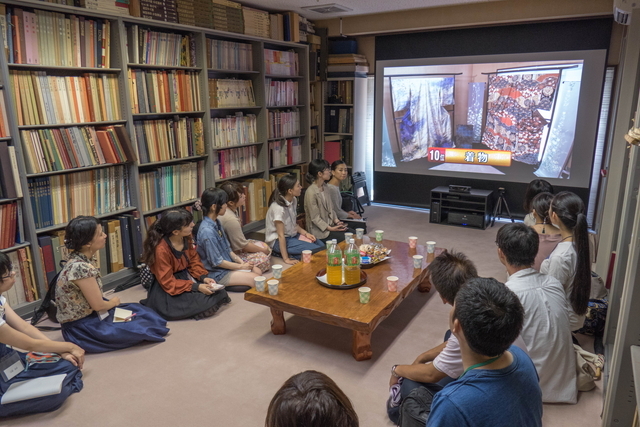 ★Students from Sendai Barber and Beauty Collage visited us. 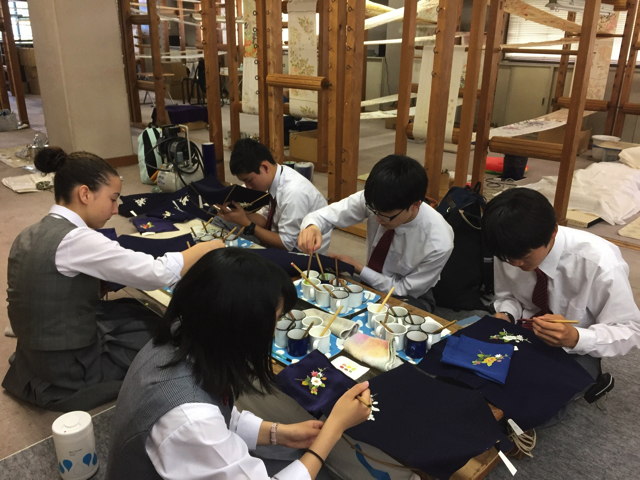 ★Students of Kanuma Higashi Junior High School in Tochigi prefecture visited us and joined our workshop. 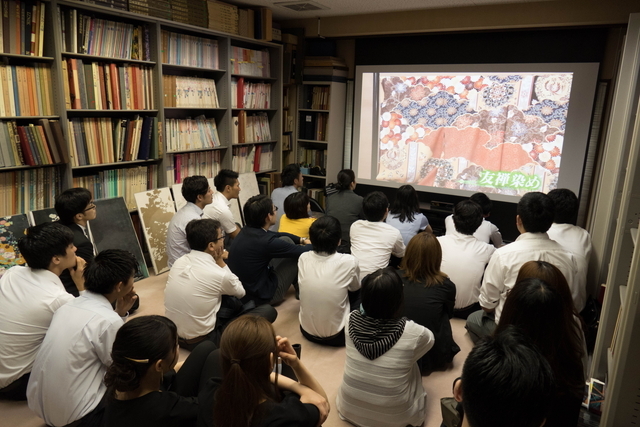 We delivered a lecture at Herbis Osaka, on the subject of “Kyo Yuzen, Now and Future”. 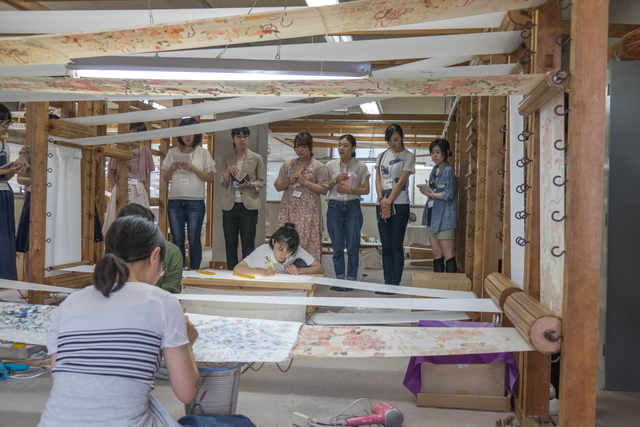 ★Oda Kimono College students visited our studio. 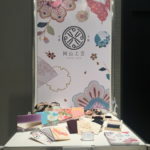 We recruited a female intern from Germany. 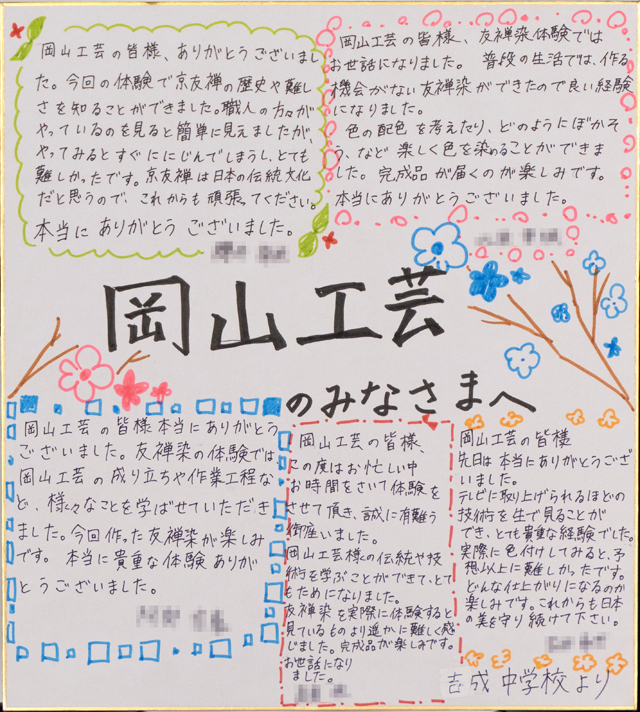 She is to work for three months. 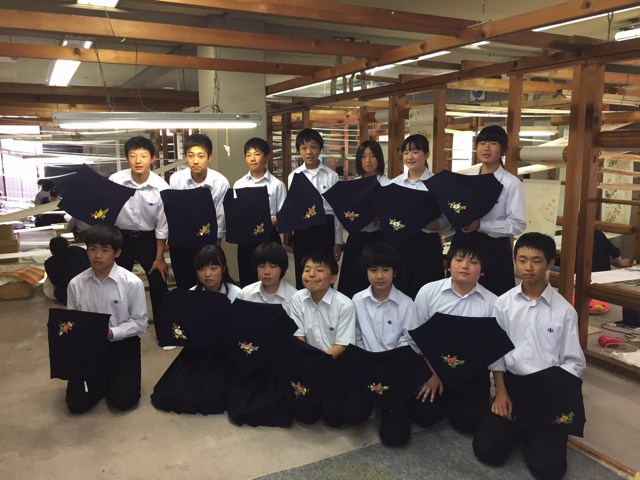 ★Students of Kyoto Saikyo Junior High School visited us and observed our work. 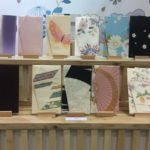 those challenges in an attempt to keep producing good things. 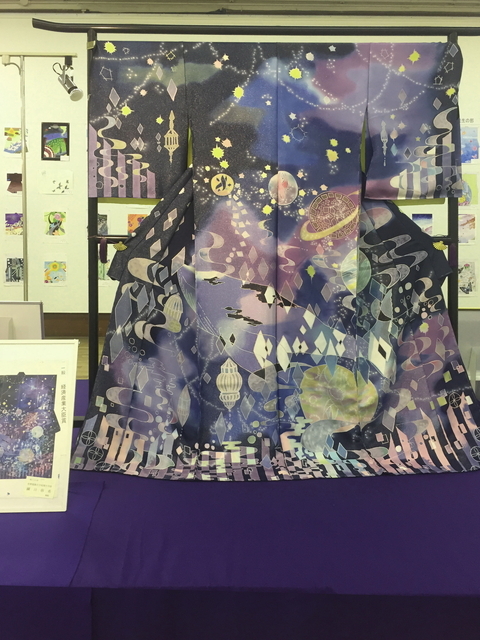 It was held In Kurume city, Fukuoka Prefecture. We worked on Nauru as we did Ireland. 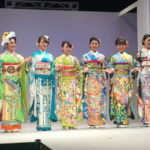 Some cute high school students modeled for the day. 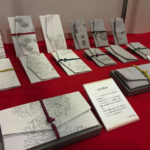 The completion was held at Miyako Messe Hall. 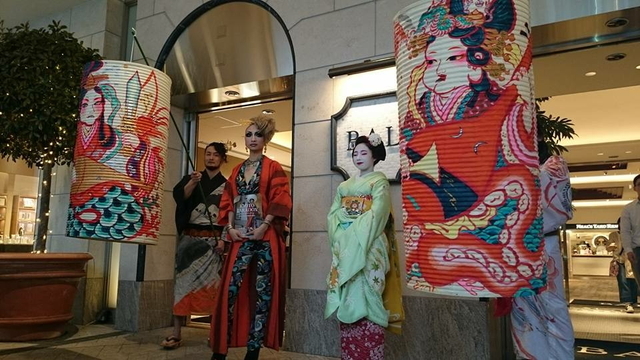 The Exhibit was held at Hotel Okura Kyoto. 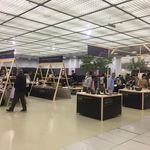 An exhibition of some works of Kozo Okayama, a Kyoto master craftsman, was held at Kyoto Station Building and at Miyako Messe Hall. 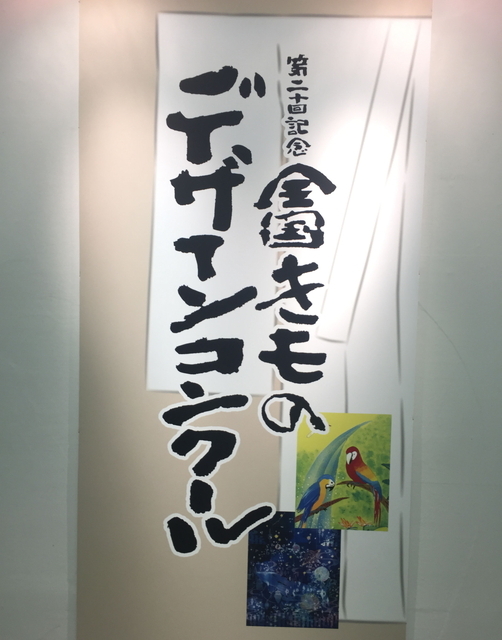 The exhibition was titled “A Kyoto Master. 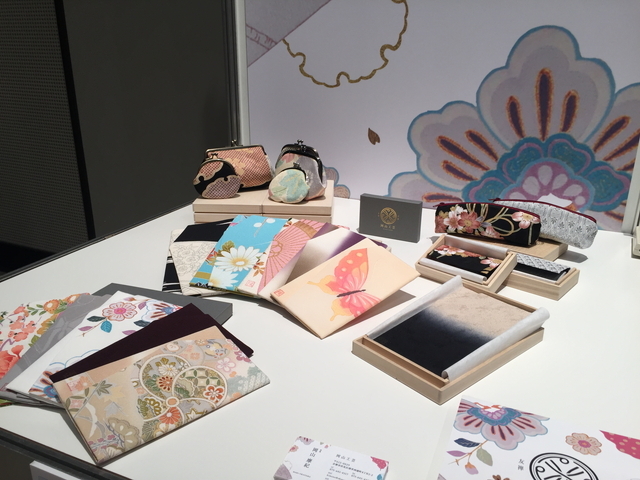 Spring & Autumn.” Concurrently, an exhibition sale for silk fukusa crape wrappers and Buddhist rosary bags took place at the same venues. 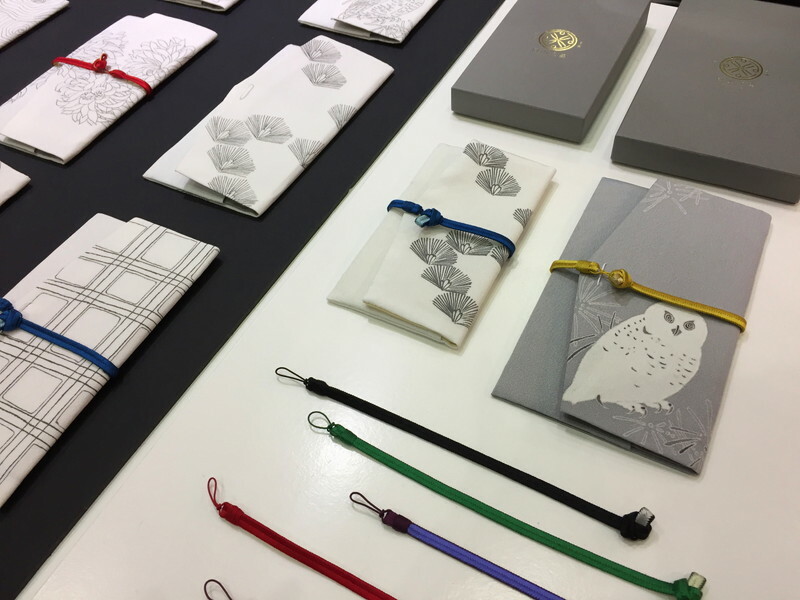 We released our new brand “ONE TONE” in the booth “Atarashikimono Kyoto” of Kyoto Chamber of Commerce. 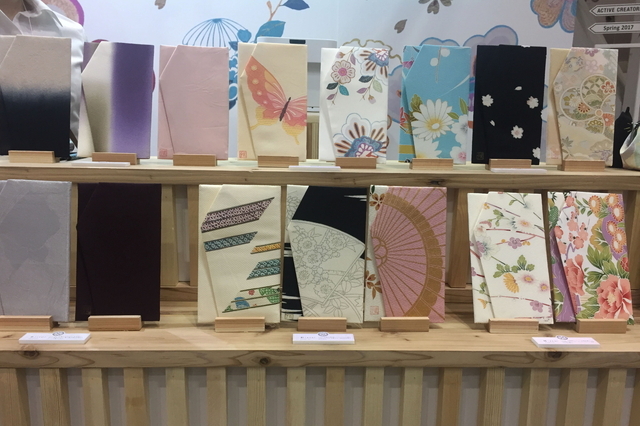 Nine designs of formal and modern Fukusa (a crape wrapper) and Nenjyu-ire (a small bag for rosaries for Buddhists) were displayed. 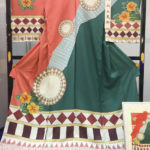 The combination with braided cords of your tastes will make wide variations to them. 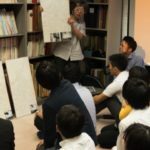 We had a lecture at Waseda University about the past and future of hand-painted yuzen. 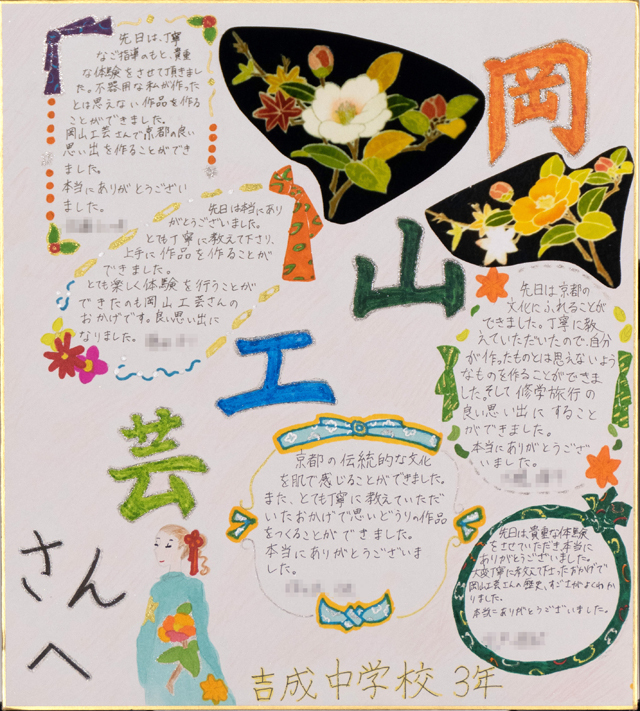 It is our hearty wish that young people become more familiar with and feel closer to kimonos. 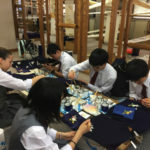 The first-year students from Momoyama Junior High School visited us as part of their studying tour. 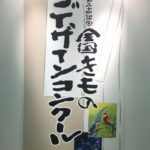 We held a question and answer session, and we actively interacted with the students. 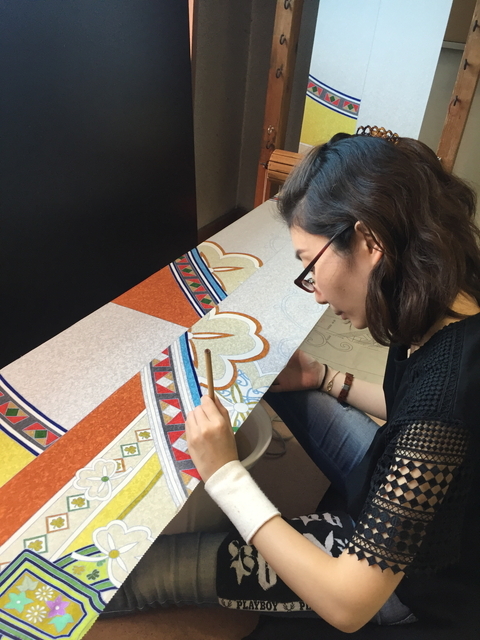 We produced a hand-painted yuzen shawl at the request of Ms. Priscila Satake, who came to Japan from Brazil on a training course of JICA. 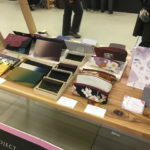 The muted-colored shawl was very well received. 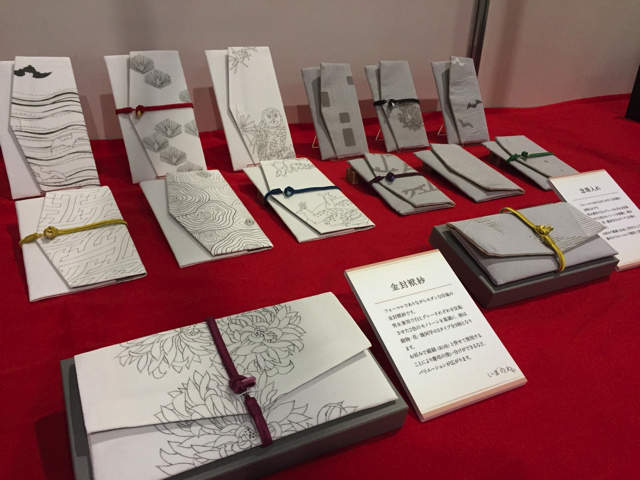 The 34th Exhibition of Craftworks was held at Kyoto Miyakomesse. 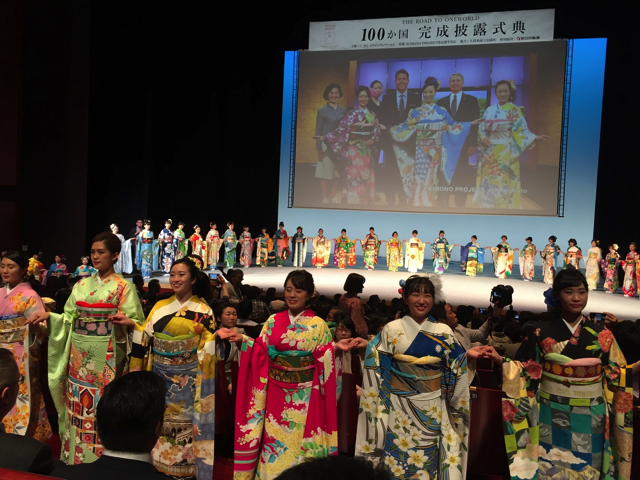 Our homongi or semi-formal kimono was given the Award of Kyoto Prefectural Governor. 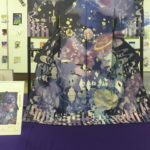 New works from the participating companies were also displayed. 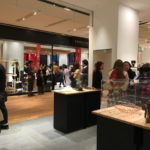 Many people visited the exhibition. 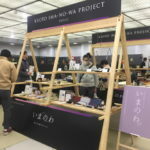 The event hosted by Kyoto Job Hunting Support Center for youth was held for the exchange between students and companies. 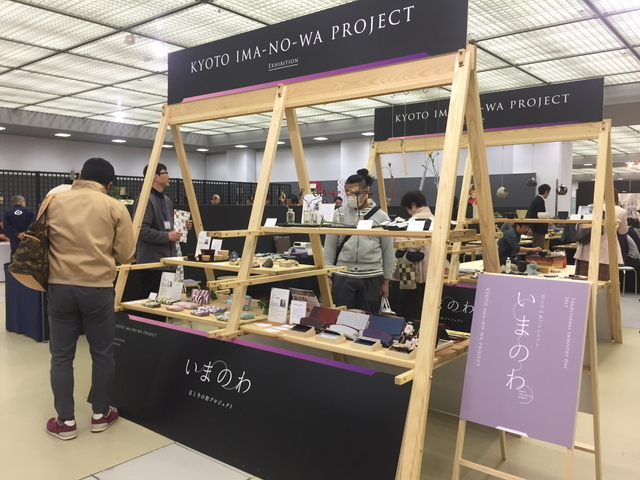 The detail of the event is also posted on the website of Kyoto Job Hunting Support Center for youth. 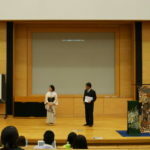 The acceptance of internship started. 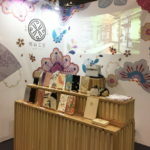 It was scheduled to continue for a half year starting with August. 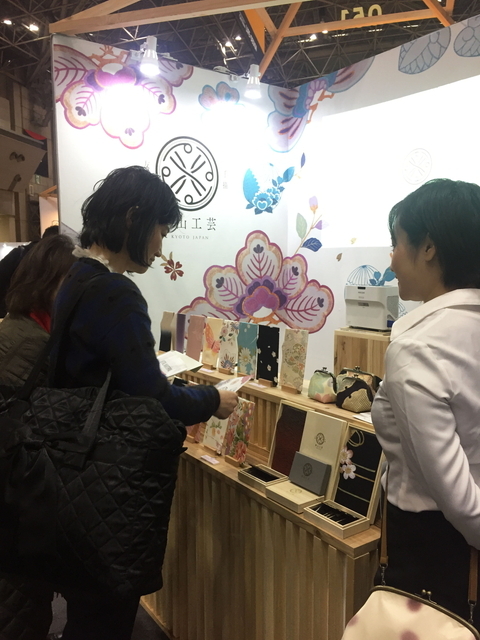 The internship student and their family member came to Japan and had a hands-on experience of yuzen artcraft. 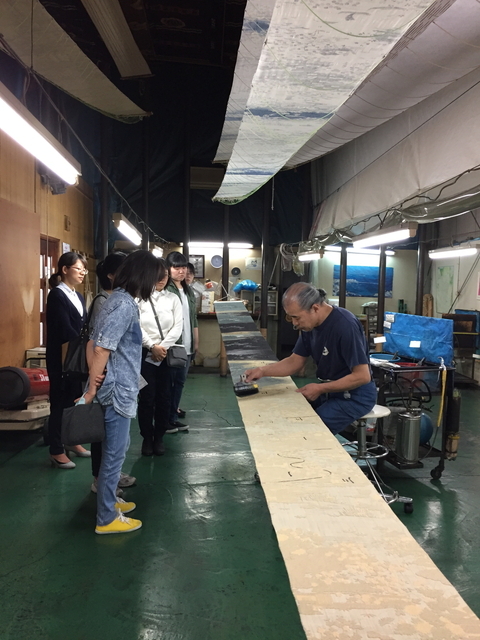 The studio tour and the company-information session took place for new comers in the kimono industry. 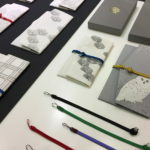 The students who majored in Design Science visited our studio again this year. 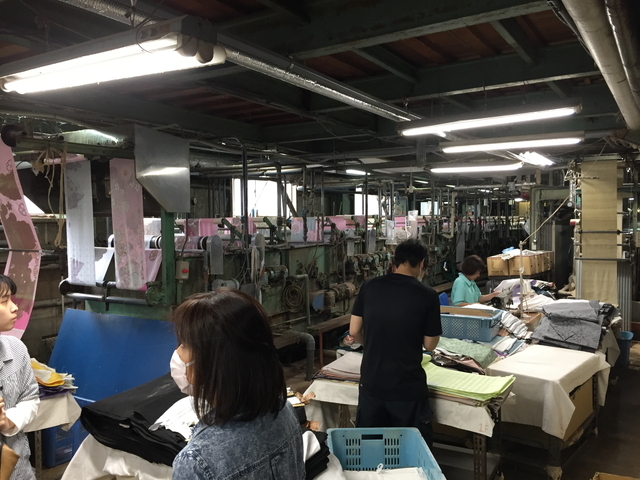 We visited factories for steaming cloth, painting cloth, gilding cloth and refinishing cloth respectively. 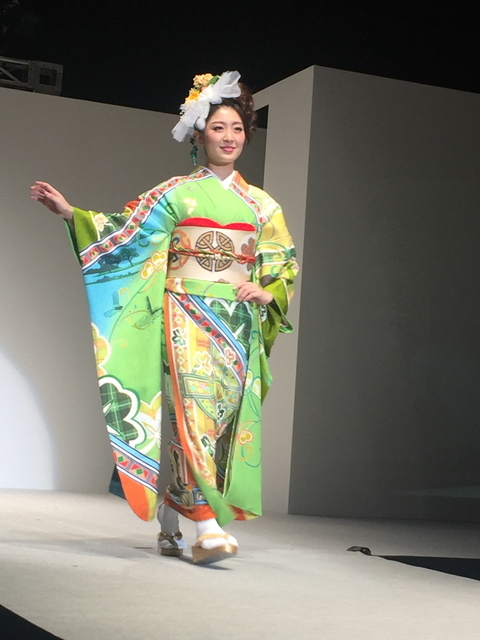 Our new effort to protect kimono culture was reported on the new. 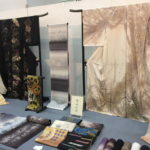 We exhibited small goods and accessories for kimono in Kyoto BAL. 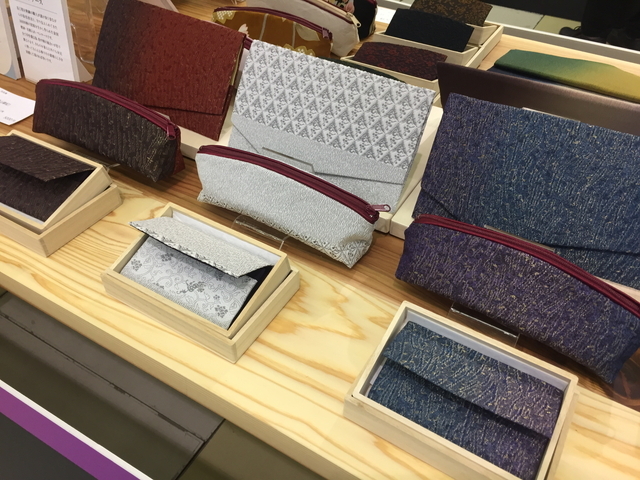 The artisans in Kyoto gathered to suggest that we should use more traditional crafts in our daily life. 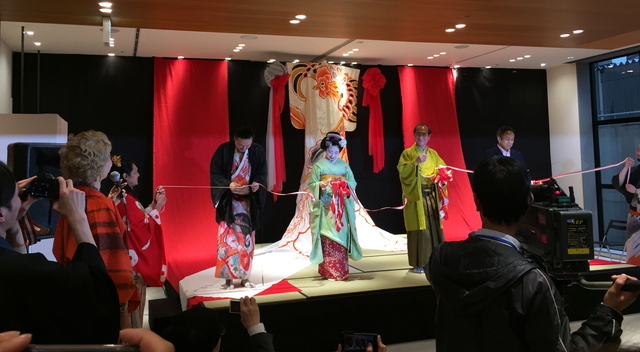 The promotion program of Kyoto. 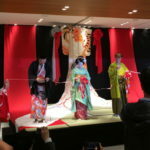 Heisei KIZOK, who is a group for promotion of Kyoto, experienced wearing Kyo-yuzen kimono and walked around Kyoto city. 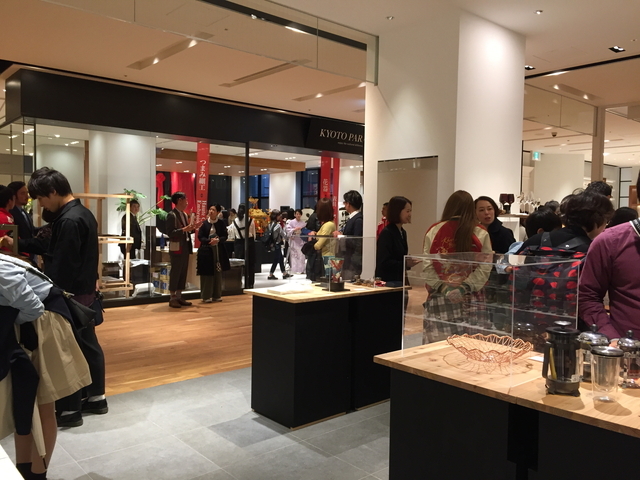 The works of Kozo Okayama were displayed and the original goods and accessories of Okayama Kogei were exhibited. 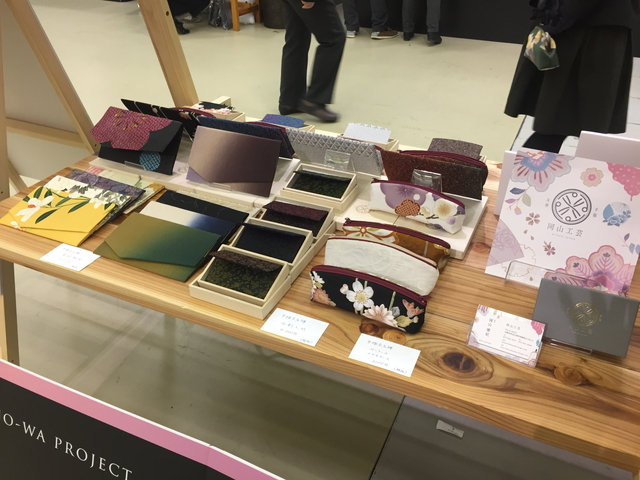 We joined the event “The day of traditional industry 2017 in Kyoto station.” Our original goods and accessories were displayed and sold. 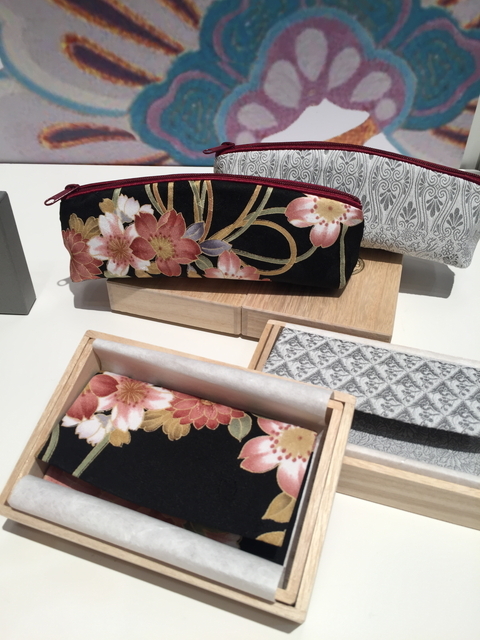 We exhibited our original goods and accessories and launched new pencil case. 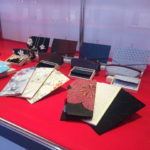 We exhibited our original goods and accessories such as Kinpu fukusa (a silk wrapping cloth for an envelope with money), business card cases and pouches. 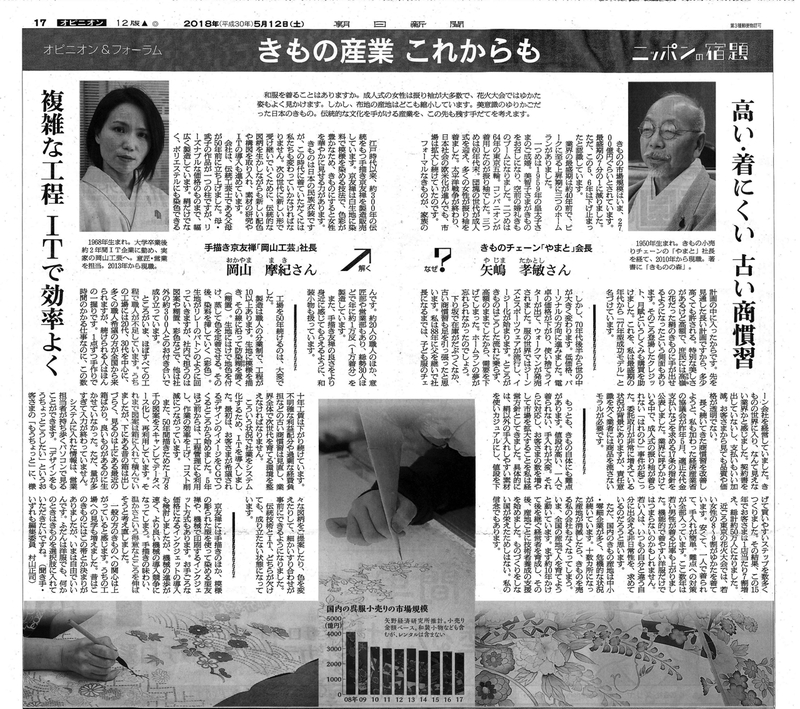 We were introduced as one of the best 10 in the ranking, which many foreign journalists recommend in Japan. 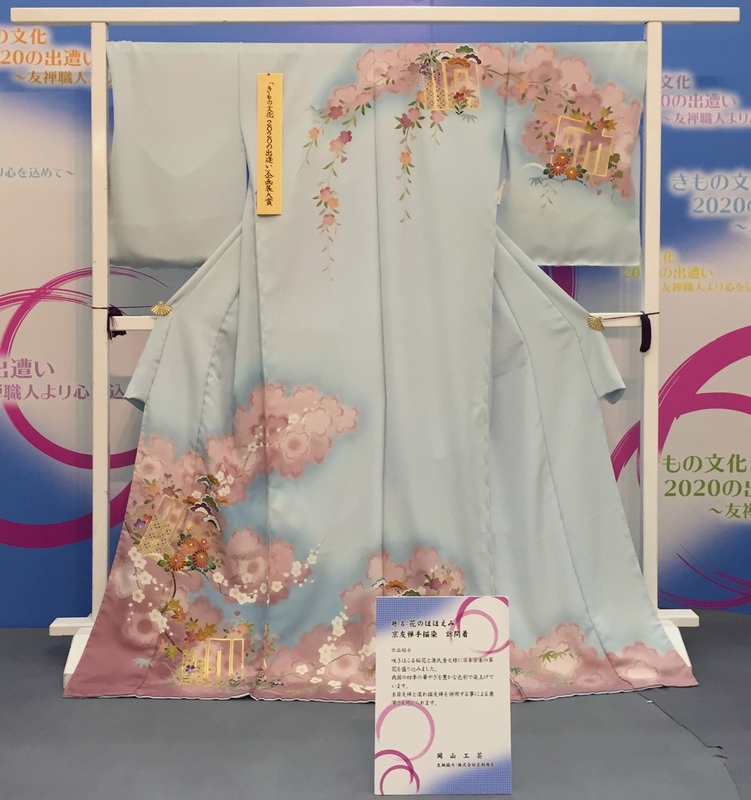 We made Homongi (a semi-formal kimono for women) which won the award of Ministry of Economy, trade and Industry. 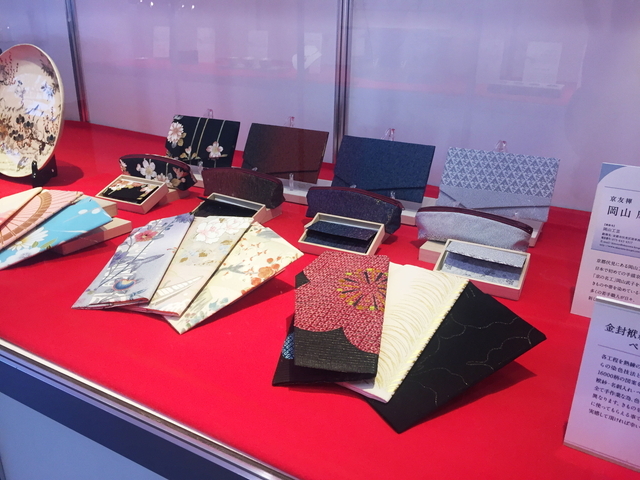 The exhibition was also held in Ojiya city, Paris, Okazaki city and Tokyo. 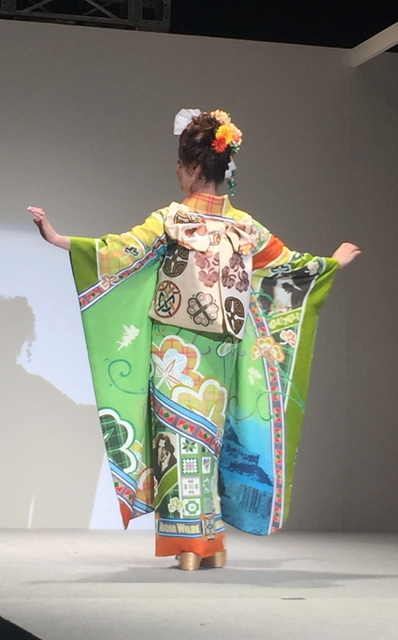 We took in charge of making a kimono for Ireland. 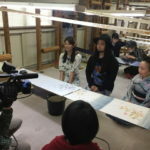 ★We appeared on “Hiroshi Takebe’s Sunday Talk” in KBS Kyoto. 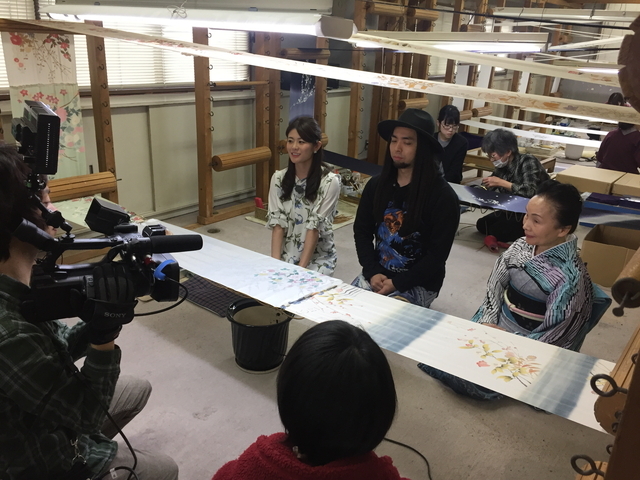 We talked with TV host, Hiroshi Takebe about kimonos which stand for culture of Kyoto. 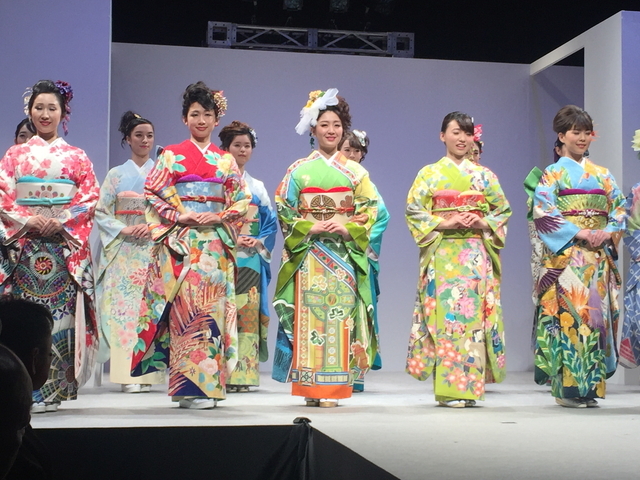 ★March 2014: Brand “haha” debut in the autumn and winter of 2014~15 “Tokyo Collection”. 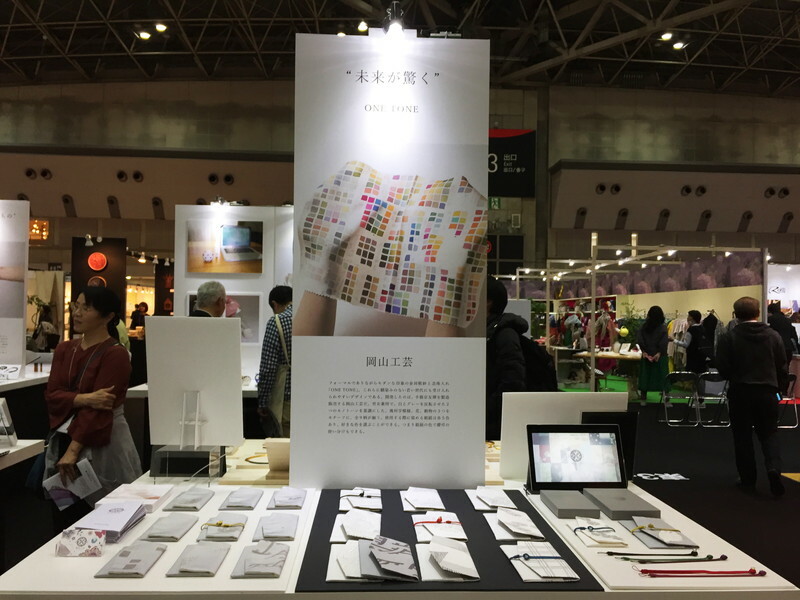 As a part of coordinating between industry and education, Yamaoka-Kougei and Brand “haha” are supplying co-developed materials for the collection. 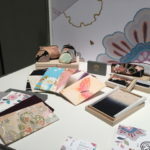 Ore stance is to always challenge the forefront of fashion, in order to spread the wonder of Kyoto’s traditional crafts. 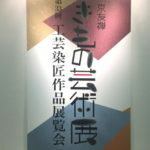 He was born in Chiba prefecture, year 1981. 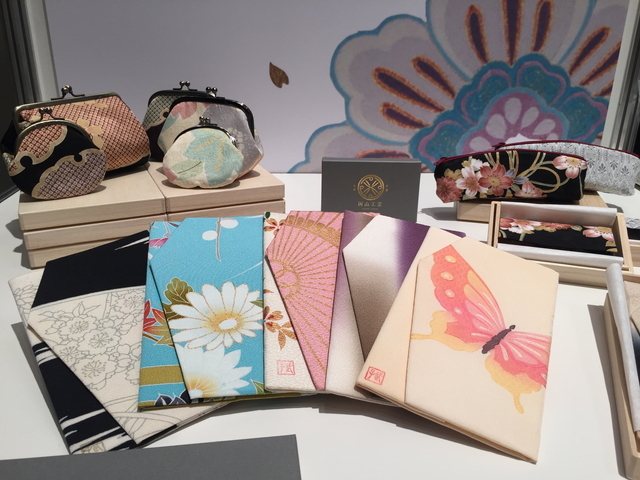 In 2003 he joins Ltd. HIROKO KOSHINO. 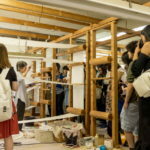 Wiles studying under designer Hiroko Koshino, he took part in fashion shows and licensing business. 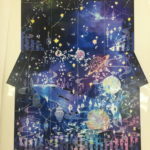 Later he was in charge of design in a children’s close company. 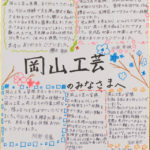 In 2011, he became a lecturer at Futaba Fashion Academy. 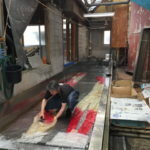 Alongside his job as a lecturer, he took part in a wide range of activities, such as designing stage costumes and costumes for musicians. 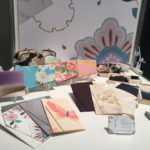 In 2012 he managed the design of Ltd. JVC KENWOOD’s showroom. 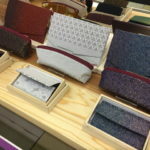 In 2013, establishes his own brand “haha”, at Futaba Fashion Academy. 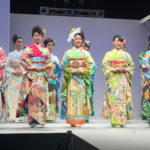 The theme is universal mode, clothes for men and women of all ages that can be worn on any occasion. I think universal design should not be close for the disabled, but close that everyone can feel comfortable. This time we used magnets instead of buttons. 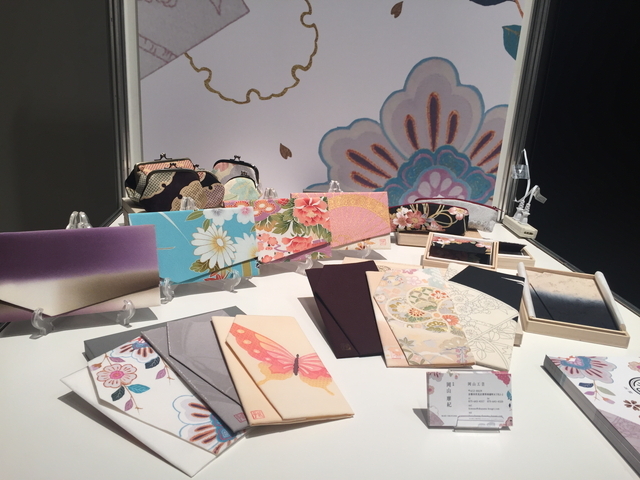 Other features are: accessories that are detachable using magnets: clothes with zips making it easy to open and close: avoiding use of metal parts that might cause allergy: functional structure making it easy for your arms to move: designs without stitches to avoid bedsores. ★February 2014: Chosen by the Ministry of Economy, Trade and Industry as “Certified IT Management Company”. A company that fits the following: Acknowledged to be using IT through-out the business: Acknowledged to have used the data acquired from IT for management decisions: Acknowledged to have attempted to optimise the company or attempted to optimise transaction between companies. 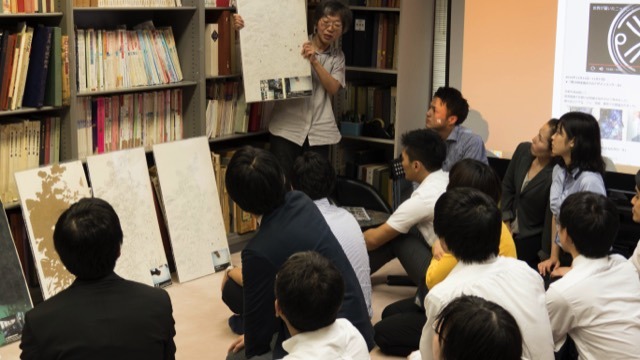 ★June 2013: At the request of the Japan International Cooperation Center(JICE), we held a Yuzen class for university students who had come to Japan from 10 different countries via The Association of Southeast Asian Nations (ASEAN). 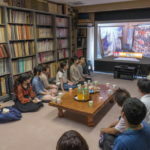 ★February 2013: Young officials from Myanmar visited us when the Japan International Cooperation Agency (JICA) held a Myanmar economic reform support program. 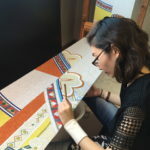 ★Mario Andrea Vattani, Consul General of Italy in Osaka visited us with his wife to tour our studio. 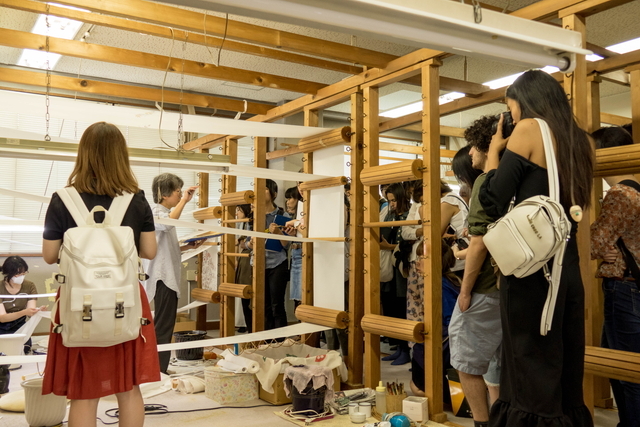 ★Philippe Janvier-Kamiyama, Consul General of France in Kyoto, visited us with his wife to tour our studio. 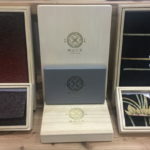 ★Kyoto Yuzen was selected to provide commemorative items for display at the London Olympics opening exhibition entitled the “Japan Experience” by the Japanese Olympic Committee (JOC). 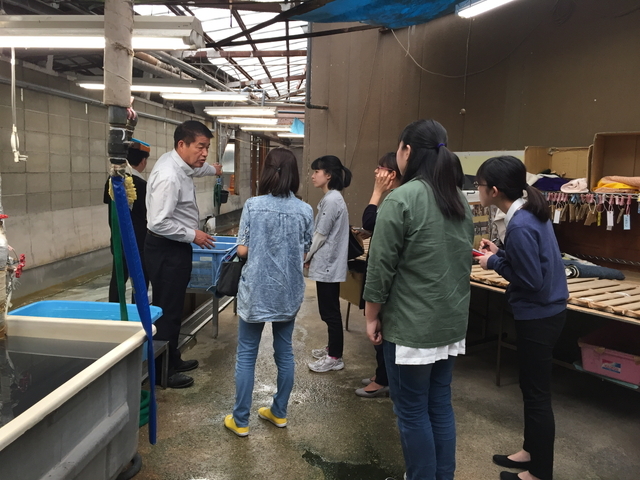 ★As part of a Vietnam SME support enhancement project by JICA (Japan International Cooperation Agency), trainee employees of the Vietnam government visited our company for training. 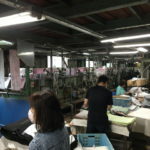 In addition, our company was featured in the January 2013 issue of the Foundation newsletter and on the website of the Foundation for Pacific Resource Exchange Center (PREX). 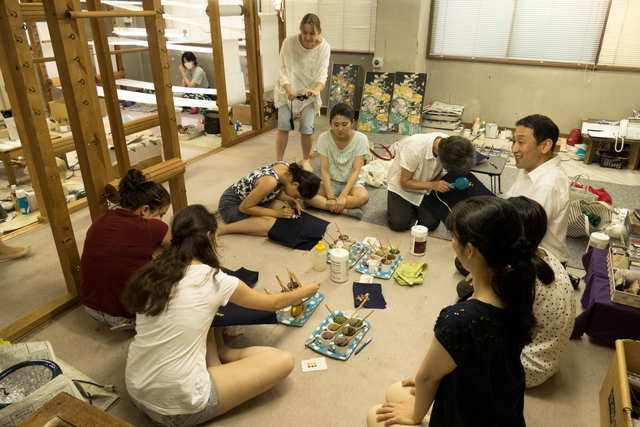 ★Members of the kimono enthusiasts group “Kyoto Kimono” based in America visited our studio. 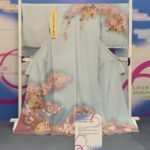 ★The Cultural Foundation For Promoting the National Costume of Japan started a new shopping website on which our Yuzen dyed kimonos are available. 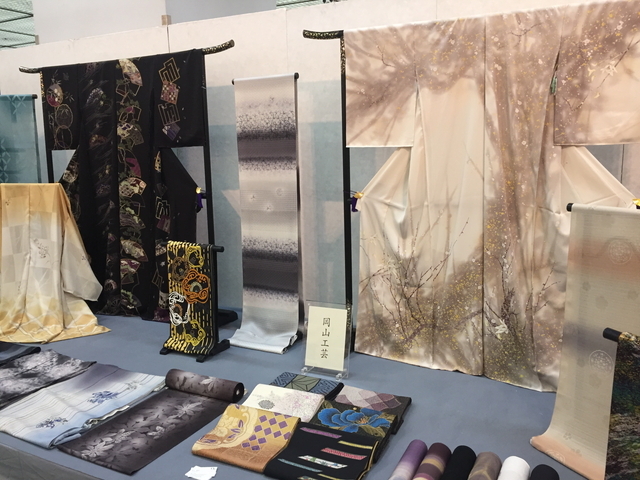 ★We were allowed to open an Okayama Kougei exhibit booth during the Japan Textile of Handcraft Exhibition at the Tokyo Metropolitan Industrial Trade Center. 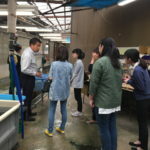 ★After receiving a consignment from The Japanese International Cooperation Agency (JICA), the Pacific Resource Exchange Center (PREX) commissioned the “2010 Promotion Policy A Training,” to which staff from ministrative organizations from eight foreign countries came for training. We held a question and answer session focusing on views from the perspective of the administrative side of foreign exchange. 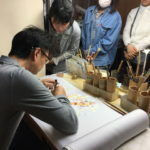 Yoshitaka Amano does not limit himself to just Japan when creating his fantastic paintings, and this time he is going to challenge himself with Kyoto Yuzen style coloring technique. 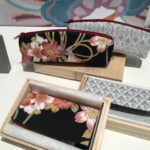 His efforts were backed up by Takeko Okayama and her staff at Okayama Kougei. 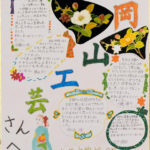 Once finished with this endeavor Amano conducted his own one-man exhibit at an old church in SoHo, New York, which was a huge success.